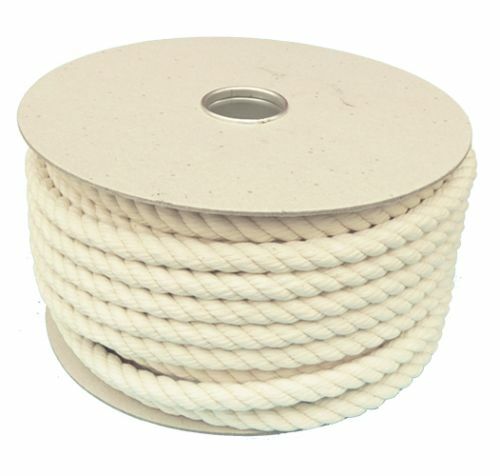 16mm x 40m Firm lay Cotton Rope supplied on a cardboard reel. Cotton Rope is a natural 3-strand rope often used for craft and decorative purposes. Cotton rope is comfortable to handle and the least likely rope to cause rope burns. Cotton rope has many uses including animal halters, circus work, magic tricks, bird or pet toys and decorative knot work. Although it is not resistant to water, oil or other chemicals it can be dyed using a proprietary hand dye. Our cotton rope is 100% natural, comes from a managed harvest and has not been bleached. Have you read our Q&A page regarding possible shrinkage and actual rope diameters? This is particularly relevant for Cotton Rope.